Hi there, I'm very new to Arduino and SmartThings, so forgive me if my question doesn't make sense. If I use this code, all I need to do is load it onto my Arduino board and it will connect with the SmartThings cloud? Will I have to do anything within the SmartThings IDE, like create a SmartApp or new Device Type? I am also new to this. 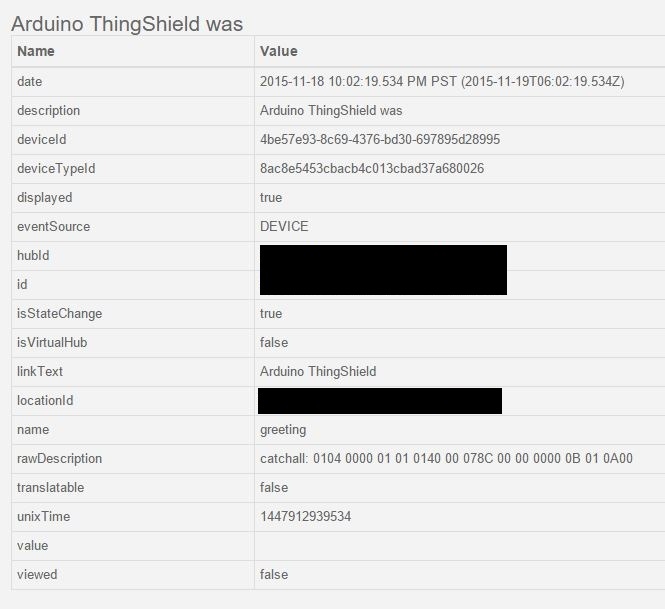 You definitely need to create the smart things ecosystem device handler that correspond to this arduino sketch. That makes sense. I'm using the "On/Off Shield (example)" device type and I have this loaded onto my Arduino. However, only the Hello button seems to generate a message and even that doesn't seem to be coming out right. I've attached a picture to show what I'm getting. I feel like there should be something in the 'value' row at the bottom. I crossed out some pieces of information, maybe unnecessarily; hopefully it's not needed to diagnose the problem.